Tourism has grown almost routinely for more than 50 years and has recovered rapidly from many crises. However, the repercussions of September 11, 2001 (9/11) have threatened to end the run. International tourism revenues have grown every year since the Second World War. Conflicts such as the 1991 Gulf War, economic crises, and ecological disasters such as Chernobyl have failed to stop the increase in international travel at any time over the past 50 years. After an initial tidal wave of cancellations following 9/11, travel bookings have resumed but are still about 10-15 percent down from last year. Travelers planning holidays seem prepared only to book at the last minute and are reluctant to commit to long-term plans. Since the attacks, the number of tourists to France, the world’s most-visited country, has fallen 20 percent. The United States, the second most-visited country suffered a reduction of 12 percent. The number of Japanese tourists leaving home—one of the world’s higher spending groups—fell 22 percent during the last quarter of 2001. The tourism industry has reacted to lower demand by cutting costs and dismissing staff. Thomas Cook, the German-based package holiday group, has reduced its 26,000 workforce by 10 percent; Walt Disney asked workers at its Orlando theme park to volunteer for a 20 percent cut in hours and salary. Worldwide 8.8 million jobs were affected. The United Nations estimates that the industry, one of the world’s largest, employs 207 million people—equivalent to 8 percent of global employment. Business travel had experienced slower growth before 9/11 due to the U.S. economic downturn. Hotels, particularly in gateway cities in the U.S. and major European countries, reported lower occupancies last year as companies cut on travel spending. The World Tourism Organization, the Madridbased UN-affiliated agency, changed its forecast for 2002 several times. The prospect for 2002 is better than for 2001 but it relies heavily on improvements during the second half of the year, when European vacationers traditionally travel to tourism destinations of warmer climates. Tourism has shown a remarkable resilience to adversity, but privately, industry insiders agree that the current situation could be different from previous crises for three relevant reasons. First, aircraft were used as weapons, which triggered a fear of flying in many people. Second, Americans, widely regarded as the most frequent international travelers, were attacked in their own country. That has led to a greater feeling of vulnerability. Third, the “war on terrorism” has the implication of being open-ended and may spill over into areas other than Afghanistan. Even so, industry officials remain optimistic. While international tourism has slowed down in most popular destinations, it has been partially offset by an increase in short-haul and domestic travel. Many families, reluctant to venture into foreign lands and to use long-haul aircraft, have changed their vacation plans to nearby domestic resort destinations. Travelers’ confidence will have to be rebuilt through increased security and countries will have to start rekindling a desire for long-distance traveling by increasing marketing. Demand will also be affected by the extent to which the costs of additional security are passed on to the travelers. One factor in the industry’s favor is that the relentless growth in world tourism is linked to cheap transportation costs and greater disposable income and leisure time in the main demand-generating countries, such as the United States, Germany, Japan, France, United Kingdom and others. In those countries (accounting for 40 percent of international travel), a holiday is increasingly regarded not as a luxury that may be cut in strained times, but as a necessity. This trend is likely to continue and extend to other countries as a result of increases in the population’s discretionary income. The Cuban economy, as in any country that is highly dependent on international tourism, suffered the immediate impact of the attacks on the U.S. Three or more days of virtual paralysis of air transportation occurred while new security measures were established in countries that fly aircraft to the U.S. Many travelers were stranded for up to a week and no new vacation travel was initiated. Worldwide, vacations were cancelled or deferred. Even the most daring tourists stopped planning ahead and made traveling arrangements only at the last minute, taking advantage of the substantial discounts offered by airlines and resort destinations. Like most of its Caribbean neighbors, Cuba watched as its tourism industry took a nosedive when people around the world cancelled vacations and avoided unnecessary air travel. October and November, considered part of the low season, were particularly depressed months as 30 hotels “temporarily” shut down and dozens more across the island closed off entire floors—about one third of the capacity in the country. Just two weeks after the terrorist attacks, hundreds of seasonal employees were sent home. Tourist industry officials in Cuba had expected the year 2001 to be a landmark one, predicting a record two million visitors and US $2.2 billion in revenues. Instead 9/11 transformed an almost sure bet into a wild card. Cuba, like other countries in the region, experienced a 25 to 30 percent decline in tourism arrivals. The slump did not stop there. Instead, it triggered a domino effect in sectors directly linked to tourism—such as construction and manufacturing. Tourism has been described in the last ten tears as the motor of the Cuban economy. After Soviet subsidies of an estimated US $5 billion per annum dried up, Cuban planners restructured the economy and sought new trading partners. Sugar, which had ruled as the kingpin of hard currency earnings for decades, was overthrown by the leisure industry and its ability to generate quick cash returns. Last year, the tourism industry’s gross revenues of US $1.9 billion outstripped Cuba’s total exports of US $1.7 billion. The events of 9/11 clearly revealed the downside of this switch. Bad times in tourism now also mean difficult times in other areas. Construction and manufacturing, including food processing—the largest branch of manufacturing in Cuba, suffered the most. The tourism industry is credited with having helped stabilize the island’s economy growth over the past ten years. An indicator of this is the high percentage of locally manufactured products, rather than imported, consumed by the tourism industry, and currently claimed to be 67 percent. The 9/11 attacks brought more bad news to Cuba. The recession it unleashed in the U.S. left many Cuban immigrants out of work, or, at the very least, fearful of lay-offs. While not stopping them, this resulted in a reduction in the remittances to their relatives in Cuba. Last year, the UN Economic Commission for Latin America determined that family remittances to Cuba totaled somewhere between US $700 million to US $900 million a year. One way to judge the amount of US dollars floating in the Cuban market is to examine retail sales in state-run dollar stores catering primarily to domestic consumption. Those sales are said to be down by US $150 million. Eramos pocos y parió Catana is a Cuban saying mentioned when matters continually get worse. Nature’s wrath has driven agricultural prices up even farther. Hurricane Michelle, a category four storm that ripped across the island flattening fields and homes in early November, affected half of the country and its population. But with the considerable damage to exports and the infrastructure, no Cuban has escaped Michelle’s wrath. The final damage toll has yet to be calculated, but it appears it could be more than a billion dollars. One “minor” economic blow to the island, but a significant political casualty, was Russia’s announcement in October that it would close its Lourdes military communications post on the outskirts of Havana, depriving the Cuban government of US $200 million in annual rent. All this came when the economy was already rocky due to the global economic slowdown. Low world prices for Cuban exports of nickel, coffee and sugar are contributing to the dismal outlook making the average Cuban worry for the future. In spite of this and all the current pressure on the island’s economy, the government insists that conditions will never deteriorate to the levels of 1994 again. The Caribbean countries received US $20 billion in tourism revenue in 2001. This represents 30 percent of their overall GDP and creates employment for 30 percent of the work force. In addition, the Caribbean receives 15 million cruise ship passengers, according to the Caribbean Tourism Organization (CTO). Hospitality industry experts anticipated that the year 2002 would be better than 2001—however, it now seems that they will only see a modest improvement. 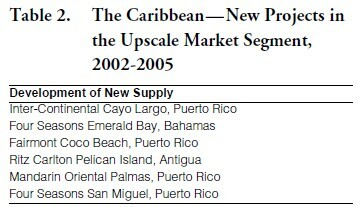 The Caribbean Tourism Organization reports data supplied by 16 Caribbean islands that we present in Table 1. Four countries report an increase in the number of tourist arrivals, however most of the increases are small and only Bermuda experienced a significant number of arrivals. Twelve destinations report decreases in tourist arrivals. The dramatic percentage decrease (40.6%) in St. Lucia, however, represents a smaller absolute figure than the 3.6 percentage decrease for Puerto Rico. Virtually all the Caribbean islands are launching promotional campaigns, particularly through television, the trade press, and the Internet in efforts to offset any fear of traveling still remaining since the 9/11 attacks on American soil. Package tours and cruise ship rates as well as hotel prices, have been discounted between 15 and 25 percent. Many hotel and travel enterprises have attempted to offset the loss of revenues by reducing normal expenses, sometimes to the detriment of the usual quality of service. The impact of this action is less noticeable, in hotels in the upscale market category. Within the full-service segment, those hotels operating under the all-inclusive system have initiated the deepest discounting in their rates. Dominican Republic. The Dominican Republic reported tourism revenue decrease of US $400 million in 2001 and expects no growth in 2002. Barbados. Barbados estimates a reduction of 18 percent in tourism revenue in 2002. Puerto Rico. Puerto Rico has not suffered as much because of the public perception of security of this U.S. Territory. The February 2002 occupancy at 78.8 percent was slightly higher than in the same month in 2001. According to Ibrahim Ferradaz, Minister of Tourism, in spite of 9/11, Cuba was able to attract 555 more tourists in 2001 than in the prior year for a total of 1,774,541 tourists. This was due to the increase in arrivals in the first half of the year before the 9/11 attacks. Compared to other countries in the Caribbean, Cuba has performed better. Total tourism revenues amounted to US $1.8 billion in 2001. However, the average tourist expenditure has decreased. In 1996 the average expenditure was US $1,474, while in 2000, it decreased to US $1,098 and to US $1,040 in 2001. Much of this reduction in average spending can be attributed to the declining length of stay that, in turn, has been brought about by improved access to the country. The Minister of Tourism reported that their market strategy for 2002 would emphasize promotion of several Cuban destinations among the retailers and direct sellers targeting the European market, Canada, Brazil and Mexico. The strategy has been identified as the best means of improving the image of Cuban tourism and reducing its perception as a mass tourism/ low priced destination. However no mention was made of the wholesaler trade, the “bread and butter” provider of demand in the all-inclusive segment. The impressive growth of Cuba’s tourism is greatly attributed to the significant contribution of this segment. Wholesalers provide attractive packages in well-designed literature that sells the destination with exciting photography at competitive prices. Some wholesalers have joint-ventured with the Cuban government in developing and operating hotels in the island. • Developers initiated the first phase of a US $3 billion project on the eastern coast of the Dominican Republic named Punta Cana. When completed, it will comprise 5,000 hotel rooms in eight properties. • Puerto Rico’s Department of Tourism announced that the island’s inventory of rooms would increase by 4,000 from now until 2005. • St. Croix, USVI expects to open a 300-room hotel and casino by 2005. • Developers plan to build a 290-room hotel in Haiti at an estimated cost of US $40 million. • In Cartagena, Colombia, considered part of the Caribbean, there are plans to build two hotels with 75 and 300 rooms to open in 2005 and 2007 respectively. • A recent study on visitors arriving in cruise ships has caused several islands to budget for significant improvements in their port facilities and in the land amenities designed to cater short time visitors. The Ministry of Tourism has made several announcements regarding development of new hotels, marinas, and restaurants expected to open or start construction between 2002 and 2004. In addition, they plan to refurbish existing hotels, taking advantage of the lower occupancy and partial closing of hotels as a result of the 9/11 events. Horizontes announced that they would invest US $48 million to refurbish 79 percent of their hotels in Varadero and build some additional rooms. Horizontes owns eleven hotels with 1,900 rooms that represent 16 percent of Varadero’s inventory of rooms. They plan to expend an average of US $39,350 per room in renovating 1,330 rooms. We estimate that almost half of the existing hotels dedicated to international tourism have reached the tenth year of their life. In the hotel industry, considering the use and deterioration received as a consequence of high occupancies, it is customary to initiate a major refurbishment of the hotel property as it approaches its tenth anniversary. Cuba would need to invest about US $730 million to bring its aged international tourism rooms to competitive physical conditions. For this calculation, we have used the estimated expenditure per room as planned by Horizontes; however, it is likely that the more likely renovation cost is less than this, resulting in a total investment requirement in the order of US $500 million. Should Cuba decide to delay or defer the refurbishment of their rooms, it will run the risk of been being forced to discount room rates to offset the market demand reaction. Additionally, it might need to face the undesirable public perception of a deteriorated destination, hurting also the rest of its market. During the last ten months the different corporations created to direct the development of tourism in Cuba have announced diverse projects that would increase Cuba’s inventory of rooms and incorporate new hotel companies’ participation in some of the projects. 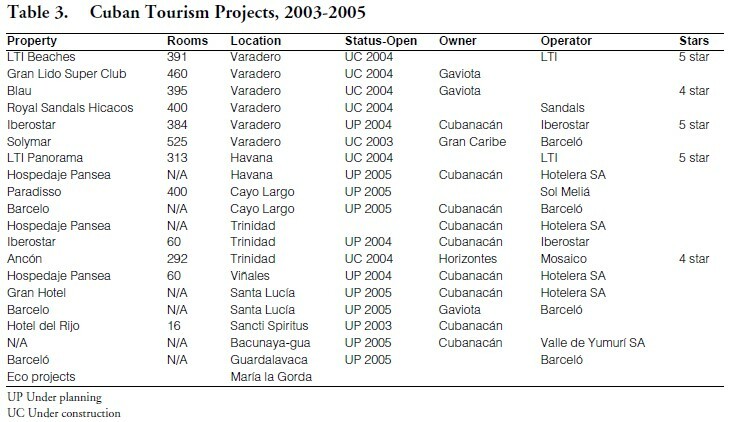 Table 3 summarizes the on-going projects in Cuba as announced by the Ministry of Tourism and the Cuban hotel corporations. These projects include a mix of resort hotels and small properties located in historical buildings or resulting from restoration of architecturally important residences in the locality. There are numerous other projects, some of them very substantial in nature, that are considered still in the planning process and which have not been factored into these estimates. We estimated the future opening of properties presently under development relying on the official announcements. The hotel project openings include those presently under construction and/or under contract and planning. They are expected to open during the period 2002-2005. We have also calculated the value of those hotels at an average international cost of US $110,000 per room (Table 4). The estimated investment cost of the new projects (US $731.6 million), combined with the estimated cost of refurbishing the existing hotels that are ten years old (US $730.0 million), amounts to US $1.4616 billion. Normally in the hospitality industry, the hotels create a reserve for replacement of furniture, fixtures and equipments calculated at 3 to 6 percent of ongoing revenues. In many cases, the reserve is timely funded so that cash is available when needed. Most probably, with the exception of a few responsible international hotel management companies, this practice is not followed on the island. Considering the decline in foreign visitors and the aggressive discounting of rates, Cuba will have to make an extraordinary effort in order to be able to fund or finance such an endeavor. To sum up, 9/11 has affected all the islands in the Caribbean differently. The big players in the region (Dominican Republic, Cancun, Puerto Rico, Jamaica and Cuba) have a greater flexibility to take measures to offset the negative impact such as shifting idle workers to other jobs, anticipating vacations and leaves, accelerating regular maintenance and executing major repairs and refurbishment, increasing promotion and sales calls, etc. Those small destinations, unless affiliated with an important hotel chain, are vulnerable for lack of some of those choices—in some cases with high social connotations. In all, Cuba and the rest of the Caribbean are doing their best to survive until the demand for Caribbean destinations increases, forecasted to happen in the second half of 2002. Those countries that do not prohibit local people to patronize their international tourism facilities have enjoyed an increase of local demand caused by aggressive discounting, normally during the off-season months, and by their choice to enjoy their vacations in the country rather than traveling abroad. Puerto Rico and Mexico have attained local demands that represent 33% and 46%, respectively, of their total rooms occupied in 2001. Cuba’s tourism industry is not able to take advantage of this opportunity due to the current rule that precludes local people from patronizing international tourism facilities. It is rumored that Cuba is studying a change to this rule to allow the growing number of Cubans who have access to dollars and other hard currency to spend at the underutilized international tourism facilities. From the economic point of view, the tourism product will have a lower cost than the products imported and offered for sale to Cubans at the dollar stores. An empty room today cannot be sold tomorrow.